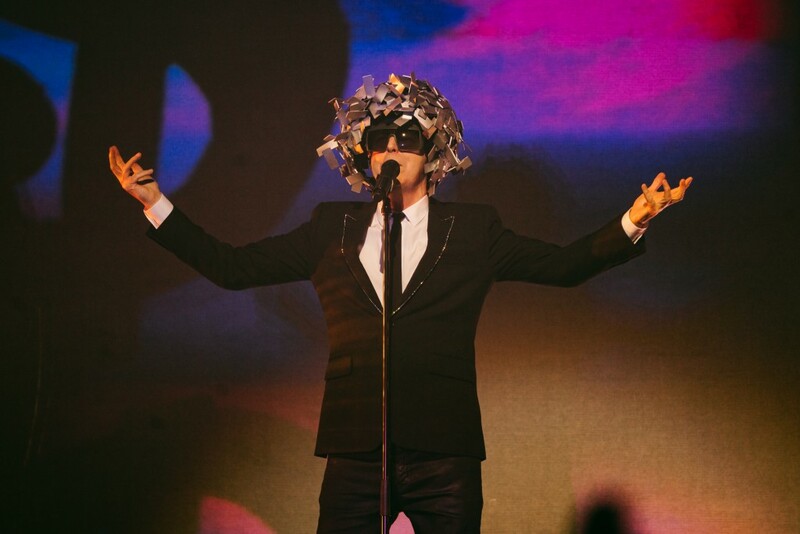 “Singapore… That was amazing,” projects Neil Tennant at the halfway point of the encore, right after The Star Theatre, The Star Performing Arts Centre was rocked by a roaring crowd, as they shuffled in complete unison to Domino Dancing — a cult favourite off their 1988 album Introspective. About 15 minutes before the signature orbs lit up and revolved the legendary British art pop duo into our trajectories, I glanced around at the sea of eager faces that packed the stunning 5,000 seat, three storey high theatre. I realized the demographic was generally in their mid 30s and above, and wondered if I would feel a little out of place. Growing up in the late 2000s to early 2010s, some of the beloved synth-pop acts my generation loved and listened to were acts like LCD Soundsystem, The Postal Service, CHVRCHES and MGMT. You could probably put some tracks in off that Carly Rae Jepsen record E·MO·TION too, if you argued your case. But these bands wouldn’t necessarily be what they are today sonically if it wasn’t for some extremely important luminaries and trailblazers such as Kraftwerk, Yellow Magic Orchestra, Human League, New Order, Depeche Mode and a certain Pet Shop Boys. Despite the deadpan, almost clinical vocal delivery that has aged to become trademark of playbook Synth-pop, the Pet Shop Boys are a group that have never felt too pretentious or distant. Instead, they’ve developed a rep for sparking up audiences with their boundless energy, gleefully spotless production, and a commendable blurring of the lines of high art and an optimistic, “just a good time!” dance-pop. Eight tracks in and with Tennant delivering the types of proclamations the word inspirational was invented for on Se a vida é (That’s the Way Life Is), and I suddenly didn’t feel too out of place anymore. Tonight, their panoramic concert experience dutifully reflects upon the contributions they’ve made to music in their sweeping 38 year career, delivering one that has unequivocally left the audience with more than just a smirk on their faces as they leave the building for the night. They’ve bestowed a shared feeling — one of appreciation, enthusiasm, and community that we’re sure would remain in their memories for some time. Right from the get go, Tennant, who’s clad in an immaculate black suit, struts around the stage with such convincing authority — he looks like he’s done this a billion times before, and he’s on top of the world. 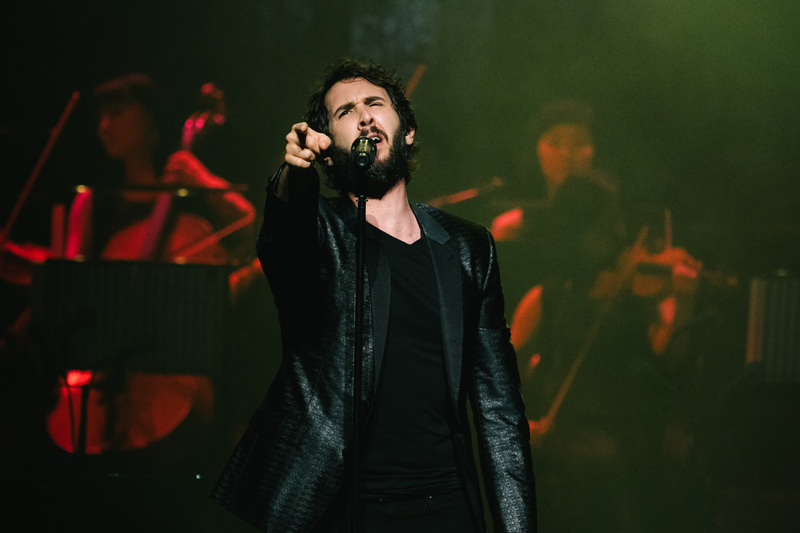 The duo energetically continues the show as they blast out hits like “Opportunities, (Let’s Make Lots of Money)” and “The Pop Kids – The Full Story”, earning the affections and enthusiasms from an equally reciprocative crowd. Listening to the Pet Shop Boys live can be quite an otherworldly experience in the right venue. The sonic textures here are remarkable: unbelievably accurate highs, crisp and clear mids, a bass that has such a bite to it, and a sound so focused within the hall that you’re left scratching your head, actually puzzled as to how they could achieve this. All this is punctuated and furnished with some impeccable video projections and lighting designs. A terrific wave of zaffre and emerald green lasers prance and dance upon every corner and orifice of the chamber, as a Kabuki drop dramatically reveals three supporting musicians with violins, keyboards, and percussions to amplify the soundstage. 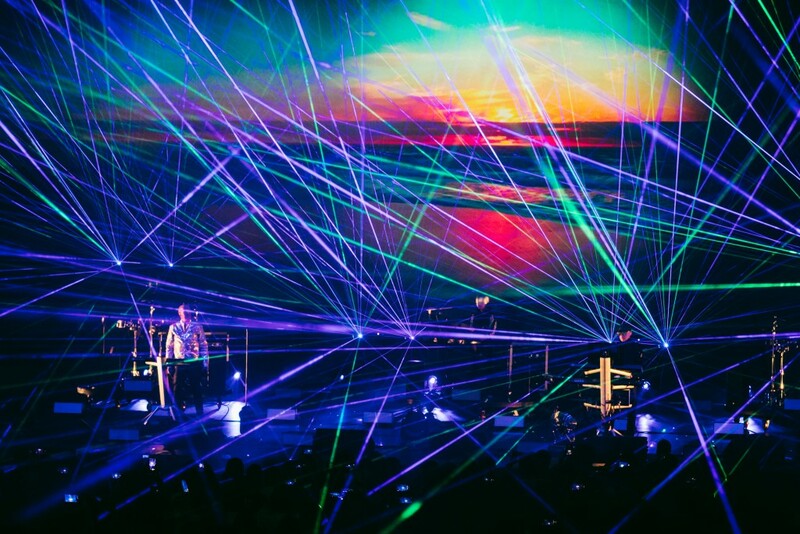 The basis for the set design for The Super Tour shows began in 2016, with a rather impressive roster of laser programmers, video projection and lighting designers, and even a set carpenter. 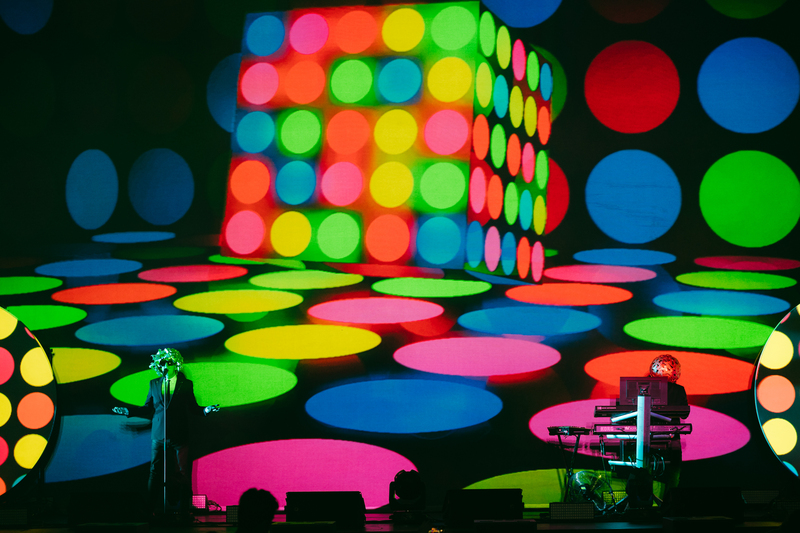 What we’re seeing is the result of a talented production collective, expanding on their own individual skill sets to collectively rise above the curve — creating a magnificent palette of never-ending psychedelic visuals and it’s one I couldn’t imagine being any better for a Pet Shop Boys show. 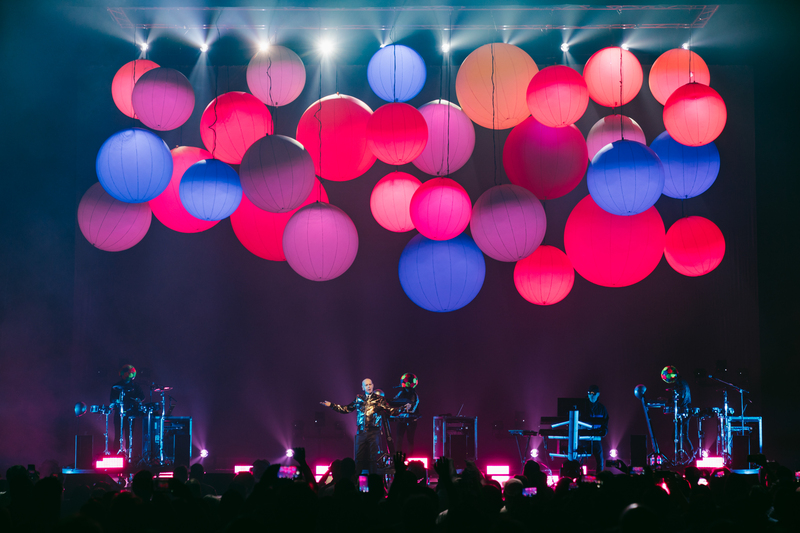 A standing ovation at the end of the show was only befitting for a group of Pet Shop Boys’ stature, with many left awestruck and content at the sheer fun and enjoyability that has defined the group for almost four decades. The sheer dedication and passion the team has produced, from conceptualization all the way to the execution is a masterclass in a live audiovisual concert experience. A night from then, and I stand at the intersection of a street as I make my way home from a day of work. Phone in my hand, earbuds with ‘’West End Girls’’ on, and I realize just how grateful I am to have spent the night with a community of fans enjoying music that truly transcends across generations.